Learn how to a create real estate report that your readers will love to read! Real estate has been slow to adopt digital media to up their marketing game. It’s a been a known fact that buyers tend to do a Google search before buying anything in real life. Buyers want to be educated, they want to know what other people think about the stuff they want to buy, and they want to know the leading brand or business that provides advice they are looking for. This shouldn’t then come as a surprise that over 67% of the buyer’s journey is now done digitally. 90% of homebuyers use the internet to find information during their house hunt. Google searches for real estate-related terms have increased 253% over the past four years. According to a report from the National Association of Realtors, among ALL generations of home buyers, the first step in the home buying process is looking online for properties for sale. Well, surprise surprise! People don’t want to get out of their house, drive around looking for “For Sale” signs anymore. They want to search their dream home while sitting on their couch using their iPads or during their lunch breaks at the office. As mentioned above, out of those 90% of home buyers look online to find their next home, 70% are looking to get to know you through your online content. For real estate companies and agents, this means that your content marketing efforts are crucial to the success of your business. You can no longer play hardball with social media or try to avoid the internet altogether. Like it or not, it is one of the most crucial paths to your professional success and you need to deploy serious strategies and tactics to win. MAKE FRIENDS WITH THE INTERNET! At 35%, millennials (buyers aged 18-35) are the largest share of home buyers, a share that has grown consistently over the last 4 years. Which means that there’s a whole new generation of people who are ready to move out of the parent’s house and look for their dream home. This comes as a blessing in disguise for realtors. Even though it’s a good thing for realtors to have such a huge percentage of people looking for homes to buy, the millennials are also one of the toughest generations to market to. Being a part of the digital revolution, millennials no longer pay attention to traditional media like television, radio or print. Thus, giving a print ad on a newspaper should be one of the last things on your minds. To market to millennials, real estate agents need to be where their audience is- the internet. According to polling by Ipsos, the average millennial with a household income of at least $100,000 spends 53 hours per week online. That’s a lot of hours dedicated to a single activity! If you want to get the attention of your target audience, its imperative that you start rebuilding your strategies especially catered towards the internet generation. START BY CREATING AWESOME CONTENT AND REPORTS! We know this new paradigm shift can be overwhelming. We are not asking you to forget all your real estate knowledge or take it behind the barn. The knowledge is still as useful as it was earlier. What changed is the medium to deliver that knowledge to the right people. 50% of consumer time online is spent engaging with custom content. 90% of consumers find custom content useful, 78% believe the organizations behind the content are interested in building good relationships. 61% of consumers say they feel better about a company that delivers custom content and is also more likely to buy from that company. 78% of customers prefer getting to know a company via articles rather than ads. Content marketing produces three times as many leads per dollar as paid search. Content marketing is a strategy to make your business easy to find online. Quality content can attract viewers to your website, which in turn boosts your search engine ranking by signaling to Google that your website’s content is relevant. Thus, by creating real estate reports that are informative, reliable, easy to read, and visually appealing can be your ticket to real estate success. A real estate report allows realtors to reach out to a large audience base through social shares. A well written and even well presented real estate report helps establish a realtors authority and expertise in their industry. Help convert prospects into clients by sending these real estate report as emails on a timely basis with the help of drip emails. Help get new leads and referrals by embedding subscription forms on websites or blogs. Make smarter decisions and optimize strategy based on campaign stats and reporting. There are numerous topics, trends, activities, ideas, statistics, news stories, and updates you can cover in a real estate report that are of interest to your audience. Choose a niche or cover everything depending upon your interest and time at hand. The important part is to make the content informative as well as entertaining. There are many topics or areas you can cover in your real estate report. A good way to find out what resonates with your audience is by dabbling with different topics for a while and see which report gets the most engagement. You can even conduct a poll on your social media pages and ask your audience what information or topic they would like to read in the next report. For the time being, here are some interesting ideas on which you can create your real estate report. We recommend making it downloadable on your website/blog or social media pages and add a lead capture form to generate new leads. You ready? Let’s go! It’s all about the community, isn’t it? The first thing you can do is create a real estate report for your local market. Educate buyers and sellers in your neighborhood about the current pricing, property trends, and other statistics worth mentioning. Let them know when the conditions are good to buy or sell. Show your own expertise related to the trends and let your readers know your thoughts when you think the market will rise or fall, and what neighboring properties they should be checking out. Whether you help close the deal or not, its a good practice to let prospective buyers know about the properties which were recently sold in your area. Buyers want to know about the neighborhood and showing data about listings is a good way to pique their interest. Don’t forget to include the pictures of residences that are hot in the community and are bound to get acquired. This creates a sense of urgency in your audience and makes them come back regularly to your site to check those listings out. Not sure what to include in your real estate report? Don’t worry, just ask your audience! Whether they want to see local listings, new trends in the market, forecasts, or just some real estate news, ask them what their preferences are. You can do so by implementing surveys on your website, your using the poll features on various social media websites like Instagram, Facebook, or Twitter, or through your email campaigns. Once you’ve got enough responses to carve out the winning topic, go all in. A prospective buyer is not only looking for the property or residence. He or she is also looking for a good neighborhood to settle in, a neighborhood with good people, access to transportation, maybe businesses and industries in the area and all the basic amenities available nearby. You can save your audience time and effort by documenting everything about the neighborhood in a well crafted real estate report. Sure they can always search online, but providing your unique perspective and recommendations can go a long way, saving them a trip to the search engines. For example, you can compile a list of your favorite restaurants, nearby attractions, movie theatres, etc. and create a report on them. You can also include places like dry cleaners, day care centers, pet shops and other services nearby to give your audience a full overview of their locality. A good way to do so is by putting up pictures and heck, maybe even a vlog of you walking around and showing them the beauty of your neighborhood. By going the extra mile (pun very much intended), you can show buyers how much you know and care about the neighborhood, possibly making you a likable and the go-to guy around the block. We can go on and on, but I think you got the point. The use cases are endless. But the real problem is, how do you compete with other realtors putting out real estate reports too? Creating a real estate report that stands out from the rest! 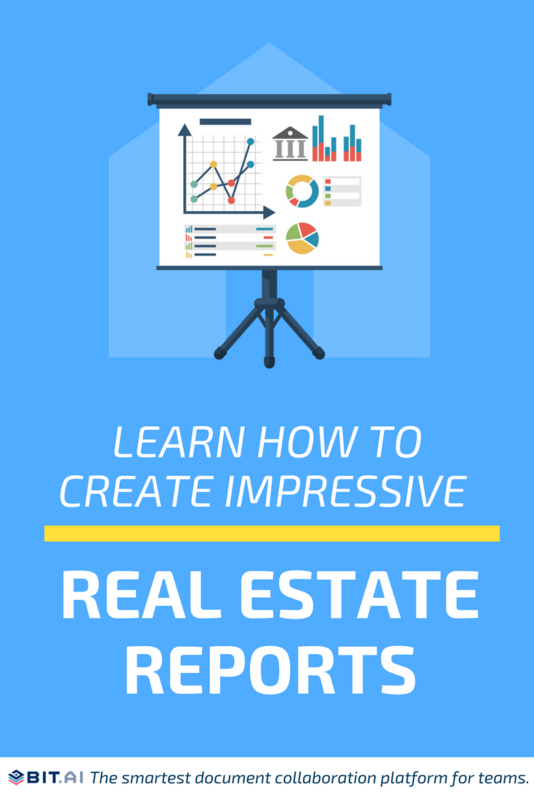 If you are planning to send out real estate reports that look exactly like any other report on the internet, how are you going to get your prospect’s attention? The best way to capture the attention and to stand out is through design. And the stats are there to prove it, as according to Adobe, two-thirds of people would rather read something beautifully designed than something plain. Although words have power, unfortunately when it comes to real estate, nothing beats visuals. If you are not creating an interactive and engaging report full of pictures and videos of your neighborhood and properties, what’s the point of even creating one? Real estate is all about visual appeal. So no more boring, long reports full of text. No more settling! Create awesome real estate reports with Bit! There are two major components that make or break your real state reports: content and design. We have discussed various niche and array of topics you can include making your report a fun and informational read. However, content alone will only take you so far. You have to present that vital information in a professional, readable, and visually stunning manner. Thus, both content and design play a huge role in the creation of an engaging real estate report. This is where Bit comes in. Bit is a new age cloud-based document collaboration tool that helps teams create, manage and track real estate reports or other workplace documents. Bit helps you make sure your real estate reports are more than just plain boring text and images. Thus, apart from allowing multiple users to collaborate on a report, Bit documents also allows users to add rich media like videos, GIFs, social media posts, SlideShares, polls & surveys, interactive charts, etc. – basically anything on the internet with a link (i.e. www.example.com, https://example.com) can be shared and Bit will automatically turn it into live visual content! Just copy-paste the URL of your content on a blank line of the document editor and hit enter. Bit then generates a live preview of your digital content within in your document. Imagine how rich and interactive your reports can become! Bit has a minimal document editor which allows you to write your real estate report without the distraction of unnecessary buttons and tabs. At the same time, it’s powerful enough to format your report in any way you like. We give you all the firepower to create an awesome real estate report, just the way you want to. Creating a real estate report from scratch can take a lot of time and effort. You have to research content, put it together seamlessly, add awesome visuals, and create an overall interactive experience for your readers. Getting someone’s help in this process can help you share the workload and get the report out quickly. Thus, Bit allows you to work with your peers to get the report ready as quickly as you can. You can create content for your report simultaneously with your peers, ask them for their suggestions by @mentoning them, and provide real-time feedback. Create interactive reports like never before! In this digital age, you need more than just text to engage your readers. All the other document editors limit your creativity by only allowing you to incorporate text and static images in your document. Since real estate reports can be text-heavy, having to read so much text can be dull and ineffective. This is why we empower you to add any type of rich media content, like YouTube videos, Google Docs Spreadsheets, PDFs, presentations, Spotify playlists, SlideShares, GIFs, polls, and quizzes, etc. to your reports. With Bit, you can create smart real estate reports by incorporating hundreds of file types and making it dynamic and interactive. Bit also has an automated table of contents based on the headers you add to your real estate report. It’s a quick and easy way to scroll to different sections of your report as a creator, collaborator, and for your audience viewing the final published report. Here’s something to think about- How do you even know whether your audience interacted or even opened your report after you distributed it online? You don’t, and this creates a big problem. You never know whether or not the report you so passionately prepared was even viewed by your audience. Imagine if you were able to track the time spent by your readers on these reports, how frequently they were viewed, and if they were viewed at all. With Bit, you most definitely can! Bit allows you to track your reports and gain amazing insights- when a document was opened, how far was it scrolled, how often was it viewed and much more. You can even add a lead capture form to your reports and collect new leads everytime someone tries to view your real estate report. Awesome, right? Creating and distributing informational and fun real estate reports can help realtors in a big way. Not only does it help them put out original, quality content, helping them boost their search engine rankings, but they also help establish thought leadership and credibility amongst prospective buyers and sellers. Bit allows realtors and real estate agencies to create best looking internal as well as external documents quickly and easily. Since creating a real estate report is no easy task- you have to research, write, and design it effectively to get the most out of it- we empower realtors to get the work done in half the time and with more conviction. Have a great time crafting that report with Bit! If you need any help, let us know in the comments below.